6 Hotels, 3 Guest Houses and 1 Bed and Breakfast. 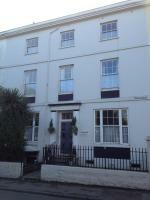 Marton Guest House is a comfortable 3 Star bed & breakfast guest house with secluded gardens in Guernsey. Located in a quiet residential area in St Peter Port, the town centre is just a 15 minute walk and Victor Hugo's house, a popular tourist attraction in Hauteville, is near-by. All bedrooms at Marton Guest House in Guernsey are en-suite and include tea/coffee trays, TV and a full English or continental breakfast.